On Tuesday, Andy took us to the Elephant Trunk Hill Park, another karst in the shape of an animal. There is a legend behind this limestone rock too. An emperor took his sick elephant to recuperate in the city and the locals and elephant got along so well that the emperor had to fight to get his animal back. The emperor ended up killing his elephant and a pagoda was built on top of the elephant-shaped hill to commemorate the event. Perhaps it loses a little in my understanding. You could rent native costumes along the banks and have your picture taken in embroidered silk garments and silver head dresses in front of the limestone elephant’s trunk. They didn’t have outfits for men, so I was crestfallen. We then went to a tea factory. The word “factory” is now a key word for an hour in a gift shop preceded by a brief educational experience. 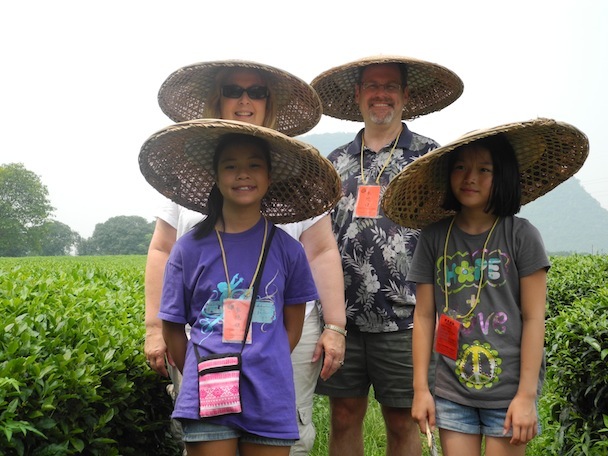 We learned about the different types of tea (white, green, yellow, black, compressed, etc.) and how they are made. They all come from the same plant, but it is the combination, size and color of the leaves harvested that indicates the type. At a tea ceremoney we sampled a few and learned how men and women should hold teacups and what kind of teapots, porcelain or clay, to use to prepare for each. Yet another example of something I’ve done wrong all my life. After lunch we went to the Xinfu Silk Textile factory. There’s that word again. Unfortunately the ratio of new knowlege to hard sell afterward was pretty low at the place. Evidently if you buy a silk comforter you can save on facial cream each night. Nobody from out group bought anything here. Andy admitted on the bus that he has eaten fried silk worm. And dog. 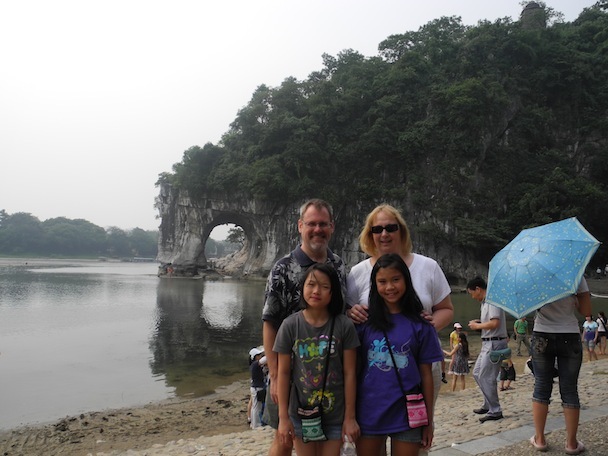 We briefly crossed paths with Katie and Claire’s best buddies from earlier on this trip; after visiting one of their orphanages, they are now a behind us in their touring of Guilin and are here another day. The rest of the group is splitting up as well to head to their respective orphanages. Our temporary guide, Bing, took us to the overnight train to Guangzhou because Andy was now occupied taking other families elsewhere. The “soft sleeper” berth on the train to Guangzhou was 6′ x 6′. There are two 2’x6′ bunk beds on either side with a small table between under the window. Below the table was an insulated pot of hot water and a volume control knob for horrendous easy listening music. We used neither.